The Humble Bundle team have a new promotion at that most welcoming price for 'free' today. 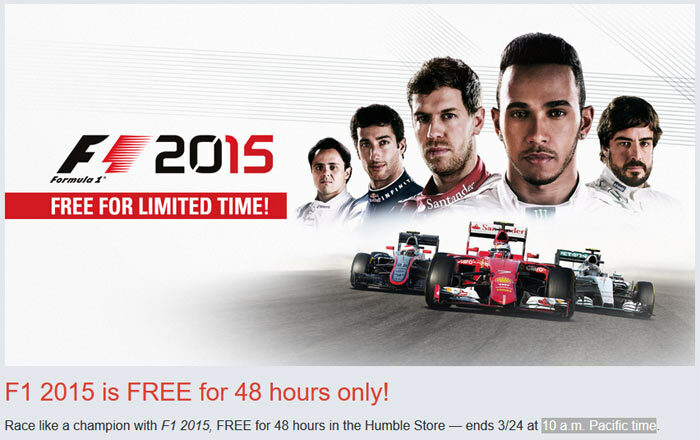 PC racing game F1 2015 is free for a limited time, apparently 48 hours. However, without advance notice of the special offer some of those hours have already been eaten away. The freebie promotion will end on Saturday 24th March at 10am Pacific time (that's 5pm in the UK, as we will still be using GMT). F1 2015 released in July 2015 and has garnered 'mixed' reviews on Steam (where it is currently sold for £7.49, at '75 per cent off'). At its debut the game sported a new game engine from Codemasters. Gameplay was said to be a "naturally authentic purely physics-based handling" experience and it boasted "enhancements and additions in over 20 areas," compared to previous years. 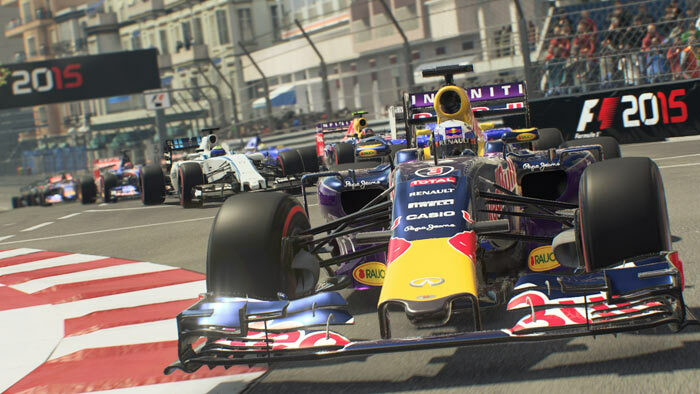 In F1 2015 players pit themselves in the 2015 Forumal One World Championship races as their favourite facing star. Features included the Pro Seson mode, online practice mode, and online multiplayer. It seems like bonus content is included too: in the form of the fully playable 2014 FIA Formula One World Championship. The minimum and recommended Windows PC specs are as follows, and there are similar but slightly different specs listed on the product page for Linux users, if you are interested. Intel Corporation in the U.S. and/or other countries. Remember that this freebie will no longer be available to download and keep after Saturday 24th March at 10am Pacific time / 5pm GMT. If you like racing games and don't own this one it might be worth a click-and-add to flesh out your Steam library. Thanks for posting, Hexus! Really pleased about this, as it gives me and a mate something new to play for free! :D Looking forwards to trying it once it is downloaded. It's the first F1 game I've had since F1 2011. Hopefully the servers will still be active long enough to allow online play. Codemasters do tend to shut things down after a while though…. jolly useful place, hexus, you know. But… is it REALLY free? Totally free? I have to join, then possibly subscribe, which means that the ONLY reason why this is free is because they want people using their service. I already have Origin, Steam and uPlay so not that bothered with another one. Thanks anyway… would have loved to have had the game. It's a Steam game as they are just a vendor, but yes you will end up on another mailing list and a lot of the games are the usual ones that also end up cheap in Steam sales.